Geographic Information System (GIS) Market size is set to exceed USD 9 billion by 2024; according to a new research report by Global Market Insights, Inc. The penetration of remote sensing platforms and navigation and positioning technologies to capture the spatial data objects and associated attributes will lead to an increase in demand for GIS hardware components, including imaging sensors, cameras, and GNSS antennas. The data captured by these components need to be integrated and analyzed for predictive analysis which further help the organizations to make informed predictions about the future events. This will increase the demand for GIS solutions during the forecast timeline. Increasing investments in the smart cities have further accelerated the adoption of GIS software which acts a common platform to enable easy integration and coordination of different participants of the smart city ecosystem. The hardware segment dominated the GIS market with a share of around 55% in 2017 due to the large-scale adoption of GIS collectors and handheld devices equipped with high-resolution cameras and sensors to capture the spatial data. The data collectors enable organizations to capture geospatial data from varied sources which is then integrated and analyzed using GIS. The mapping application segment held majority of the geographic information system market share amounting to over 40% in 2017 due to the widespread adoption of the GIS software to integrate, manipulate and present the geospatial data and let the users to produce graphic display of information for analysis. GIS mapping software helps in mapping the position and any changes occurring in the areas and allow GIS professionals and surveyors to gain insights about changes that occur in the specific area. The GIS adoption in the agriculture segment is expected to grow at a CAGR of over 15% between 2018 to 2024 due to the increasing applications of drone technology. Drones are rapidly being used by the farmers to assess crop condition. As these collect vegetation and topography related information, the demand for GIS will increase during the forecast timeline. Asia Pacific geographic information system market is expected to grow at a CAGR of over 15% during the forecast timeline. The GIS market growth is attributed to the factors such as rising urbanization and development of smart cities and various efforts taken by the government agencies to strengthen spatial infrastructure of the satcom industry which further triggers the need to have more advanced GPS systems and navigation platforms to capture the location-based data. For instance, in May 2018, the Australian Federal budget allocated over USD 300 million for the establishment of space agency. According to the government, the funding includes USD 15 million dedicated to partnering with international space agencies to enable Australian businesses to compete in global space economy. The increasing penetration of the drone technology in sectors, such as defense, transportation agriculture, and urban planning is expected to drive the geographic information system market growth. For instance, in March 2016, the Indian Railways and ISRO signed an MoU for developing applications in the field of remote sensing and GIS. The MoU enables the use of space technologies and tools to provide passenger information for all trains, real-time train tracking and survey of rail route alignments in difficult terrains. Companies operating in the global geographic information system market are investing heavily in their research and development activities to come up with the innovative products and software to cater to their clients’ requirements. For instance, in October 2015, Esri and Trimble offered the R1 Global Navigation Satellite System (GNSS) for collecting professional-grade GPS data with the collector for ArcGIS. By offering a complete and integrated solution that provides accurate data collection enable their customers to build a better asset inventory. 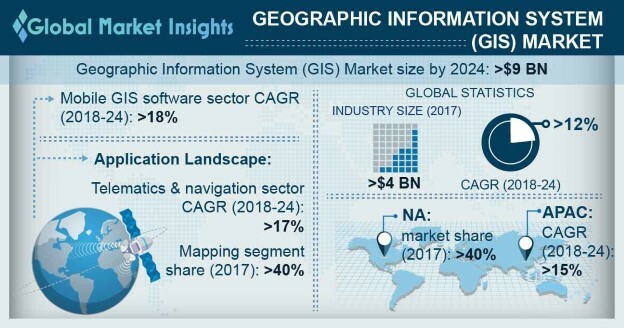 Some of the key players operating in the geographic information system (GIS) market are Bentley Systems, Supermap, Pasco Corporation, Autodesk, Schneider Electric, Pitney Bowes, ESRI, General Electric, Trimble, Hexagon, Topcon, MacDonald, Geoinfo, Geosoft, Harris Corporation, Hexagon, Hitachi Solutions, MDA Information Systems, and Unistrong.